On the Barnes farm, south and east of this marker, one of the first military aviation training centers in the U.S. was established in 1916[?]. After successful flights the second Wright airplane in 1909, the Wright brothers agreed to the establishment of an Army Aviation School at College Park. Md. 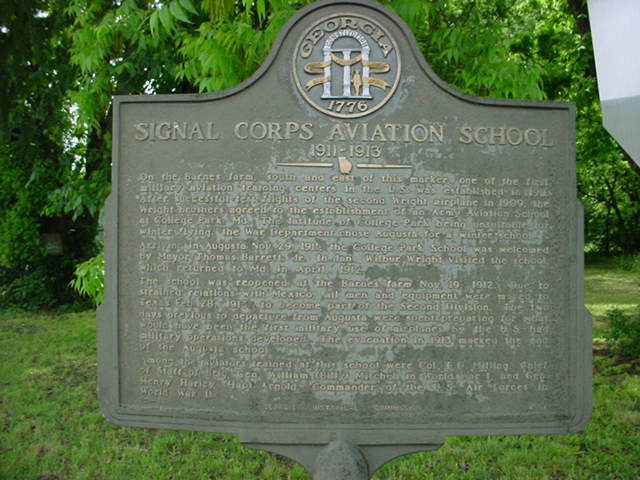 The latitude of College Park being unsuitable for winter flying, the War Department chose Augusta for awinter school. Arriving in Augusta November 29, 1911, the College Park School was welcomed by Mayor Thomas Barrett, jr. in Jan[?]. Wilbur Wright visited the school which returned to Maryland in April 1912. The school was reopened at the Barnes farm Nov. 19, 1912. Due to strained relations with Mexico, all men and equipment were moved to Texas Feb 28, 1913[?] to becoma part of the Second Division. The two days previous to the departure from Augusta were spent preparing for what would have been the first military use of airplanes by the U.S had military operations deveoped. The evacuation in 1913 marked the end of the Augusta school. ??????????? rest unreadable, bad image ???????????? 121-? Georgia Historical Commssion 19? ?